On Wednesday, November 2, San Diego's culinary community will converge at The Music Box in Little Italy for a delicious party as fellow restaurant industry insiders rock the roof off a packed house all while other eateries showcase their fare to concert goers. Battle Of The Chef Bands is an annual fundraiser where bands made up of restaurant employees and chefs compete battle-of-the-bands-style to benefit the domestic violence awareness efforts of the esteemed Center for Community Solutions and the sustainable consumption education mission of the Berry Good Food Foundation. We are raffling off 2 passes to attend, as well as offering promo code SDVILLE to save $10 per ticket (must use Brown Paper Ticket link). 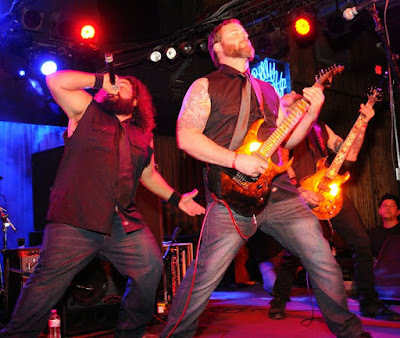 What started a few years ago as a benefit where San Diego chefs and their staff came together to play the Rock Band video game and do karaoke has evolved into legitimate, tried and true bands that just so happen to be made up of local chefs and industry insider. This year's 6th incarnation of the Battle Of The Chef Bands has moved to a new venue and will be unlike any other, as the talent continues to flourish. Also new this year, the event is sponsored by Jack Daniel's Tennessee Whisky. Get ready to see at least 8 live bands, all while getting the chance to enjoy samples from 12 participating vendors, including Big Front Door, Urban Solace Restaurant, Searsucker, Hodad's, Arterra Del Mar, 608 Oceanside, Sirena Cocina Latina, Ironside Fish & Oyster, Cupcakes Squared, Specialty Produce, Manzanita Roasting, Chef Flor Franco of Indulge: Eat, Drink, Travel. There is also a riveting auction and raffle prizes, as well as a no-host bar featuring signature drink recipes from event sponsor Jack Daniels. This year's bands include Le Chateau (Modern Times Brewery), Michelle Lerach/Fernando Gaxiola of Baja Wine & Food, Rick Alles & the Esquires featuring Chef Deborah Scott, Burger Lounge Rocks, Hot Damn Sextet (George's at the Cove and Snake Oil Cocktail), Richard Walker's Pancake Party House Band, Murder City Saikos featuring the sushi ninjas of SAIKO Sushi, Cheeky Blinders of Jayne's Gastropub, Drunkin' Punkin' Idiots of Hodads, and Screamin Yee Haws of Hodad's. Sam The Cooking Guy and Dining Out San Diego's Josh Kopelman will be back as Masters of Ceremonies. "Chefs do so much work for charities around San Diego that I wanted to have a fun event where they could just have fun....and rock out,"exclaimed Kopelman, who has worked long and hard to perfect this benevolent event. "Chefs are not only talented artists in the kitchen but many love to play music." Tickets to the 2016 Battle of the Chef Bands are available online starting at $55 and entitle the holder to entry and tastes from participating restaurants. Promo code SDVILLE saves $10 per ticket when purchased on Brown Paper Tickets by following this link. Proceeds benefit the Berry Good Food Foundation's goal of spreading sustainable consumption education throughout the community, as well as the Center for Community Solutions, whose mission is to end relationship and sexual violence by acting as a catalyst for caring communities and social justice. 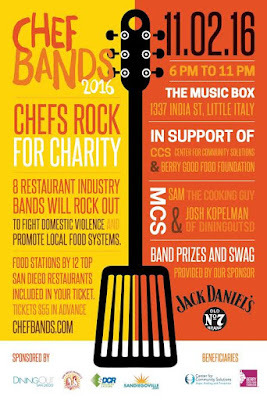 For more information on the 6th annual Battle Of The Chef Bands, visit chefbands.com.